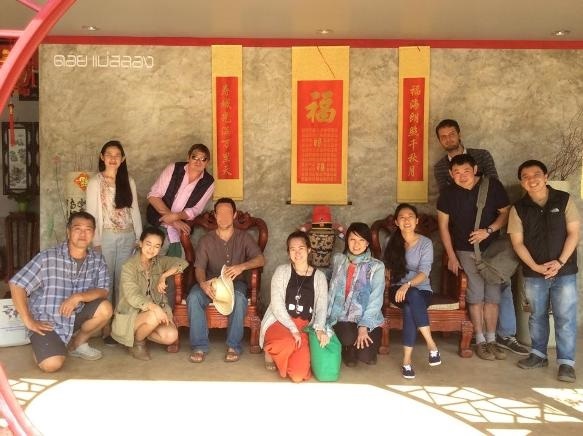 In a blog article published in October 2014, we had introduced the new Teamaster School at Doi Mae Salong, north Thailand, consisting of a 4-days practice-oriented on-site course and an extended follow-up online course to cover for all the theoretic details that would go beyond the scope of what can be conveyed on site. The feedback on this blog article had been overwhelming! A number of people had contacted and registered for the course through us, others had inquired for follow-up dates, as they were otherwise engaged during the scheduled course date, and even more people showed general interest and genuine support with their questions and cheering. So, now, I think it’s time for a recap! How did the tea course go? How was it received by participants? And: did it prove its money worth? A group of a dozen students have participated in November’s tea course, with most of them having a professional background with tea, being tea traders, tea shop owners or other tea professionals on the one or other level. This didn’t come as a surprise, as the tea course’s professional and/or trade orientation had already been suggested by the course’s curriculum, the professional level of ITMA Teamaster certification being awarded to participants, and last but not least the not exactly pocket money level of the course’s tuition fee. 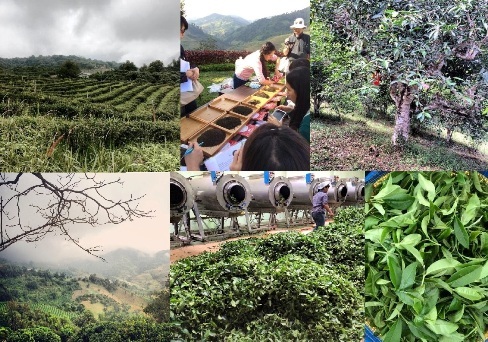 It is easy to see that requirements are different for an audience of tea professionals as they would be for the private tea lover, who just wants to know more about tea and/or seeks to gain live insights to the world of tea on producer/origin level. In this regard, I have come to the conclusion that it might be a good idea to divide the tea school’s course portfolio into 2 separate course categories, one dedicated to the private and/or beginner level and another one for the professional and/or advanced level. And in fact, the course organizers are currently working on just this, so the on-site training part of the next scheduled course (see last section below for course dates) will come as an optional 2-days or 4-days training, with the 2-days option representing the beginner level and the 4-days course representing the advanced level. Also, people who are interested in acquiring the theoretical knowledge basis, but are shying the effort or costs involved in the on-site training, can opt to take the online course only. 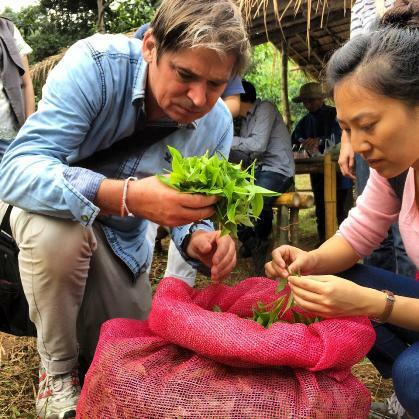 we’ve had J. T. Hunter from Wild Tea Qi, conceiver and organizer of the new tea school, speaking up in the form of an extended interview on the tea school and courses, which we have published in full in the article. In our recap now, I thought we’d give the word to one of the course participants instead. To do this, I have asked Swedish national Kenneth Rimdahl to join me for an interview, where he would talk about his experience as a course participant and tell us, whether the course lived up to his expectations, whether he believes that the lessons given at the course have improved his tea knowledge and enriched his tea-related professional resources, and whether – in retrospect – he considers the tea course worth the investment. Kenneth is the founder and owner of Monsoon Teas, a Chiang Mai company that has taken on the hard task making tea more popular in Thailand by creating a range of artisan tea blends & creations on the basis of Thai teas and bringing it to the Thai people via Monsoon Tea Shop in Chiang Mai as well as a range of culinary establishments throughout the country. A master tea blender and tea taster with more than 20 years of experience in the tea industry, Kenneth has visited and studied at many tea cultivation sites before, especially in China, and also knows the tea business inside out from being a major partner in a large Spanish tea shop chain. I’ve met Kenneth in Chiang Mai a while ago, when he first opened his Monsoon Tea Shop at JJ Market, which you can call Chiang Mai’s only proper tea shop without further thinking, and we quickly became friends. The following telephone interview, which has been conducted in a rather casual atmosphere via phone on January 14, 2015, has been recorded and transcribed for publishing purposes and is presented here in full and without any omissions, modifications and/or amendments. Also, all pictures in this article, shot during the course, are kind courtesy of Kenneth Rimdahl and Monsoon Tes. Thomas (SiamTeas): Kenneth, thank you so much for taking the time to sit in for an interview about November’s teamaster course at Doi Mae Salong, in which you have participated as a regular paying customer. Is that right? Thomas: Then let me start with the question I am most curious about: why would you, a tea professional with 20 years of experience in the tea business, with an extensive travel record of world’s most famous tea sites and certainly already knowing all the basics about tea and most probably more than that, participate in such a tea course? Or, in other words, what that you didn’t know already could any such tea course possibly offer you? Kenneth: You’ve already said it, my background with tea might be extensive, but it is a professional background. I certainly did not participate in this course to learn basics such as what is the difference between green, black and Oolong tea. In this case, large part of my motivation to join in this course was the personality of the operator, J. T. Hunter. It’s not that I would have known him. I had read his book (“Wild Tea Hunter”) and I had studied his (Wild Tea Qi) website and I had been deeply impressed by his approach to tea. Thomas: Now, that’s interesting. So, can you tell us something about that approach? Kenneth: Jay simply starts on the other end, not on the consumer market and its trends and demands, but at the very tea plant itself. He sees great value and beauty in that tea plant, both more or less lost in mass processing and on other stages of such tea on its way to the end consumer’s tea cup. 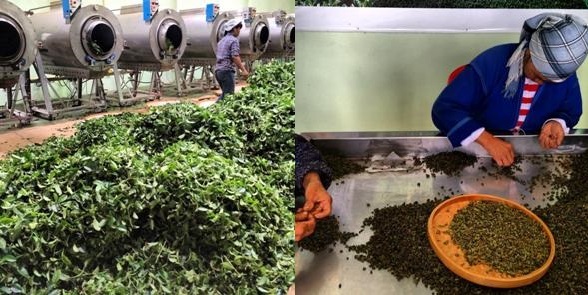 So, Jay believes that high quality tea can only result from highly individual processes, with the initial value and beauty of the tea plant not being deteriorated but in contrary enhanced in the further processing. It is a holistic perspective of tea. For example, you can see the use of pesticides, the destruction of natural areas or the cutting of forest for the sake of producing tea in the cheapest possible way as factors that will cut on the tea’s value. Destroying and pulverizing the tea leave in order to get it into a tea bag is another, even more obvious way to cut on the tea’s value instead of adding to it. if you thin about it, you will find more examples. Thomas: I could go on discussing just this for hours, but let’s get back to our actual topic, Jay’s new tea school at Doi Mae Salong. Somehow, you still haven’t answered my initial question yet. Now, what was it that motivated you to join Jay’s tea course? Kenneth: I expected to find some of that spirit there, and as I had only started approaching tea from that perspective myself, I was keen on learning a completely different view on my own trade. And you know, this is what it was! I need to admit, I was at first a bit disappointed by the way Jay presented himself at the course. He didn’t actually present himself much like you would expect it from a mentor or teacher, but rather seemed to play the role of a “grey eminence”. 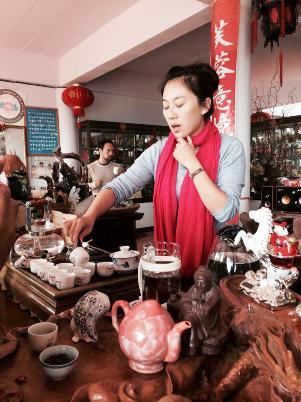 As the true teacher and mentor, he brought in Shana Zhang from Yunnan, who is his partner at Wild Tea Qi, and she turned out to be the real highlight of the course! You know, Shana is simply incredible. She is a walking-talking lexicon of tea. She knows EVERYTHING about tea, from the history and spread of the tea plant and its cultivation and use via all possible details about the diverse ways of tea processing to different types of teas to the – as I have just learnt – high science of preparing tea. By the way, this had been another point luring me to this course: the Chinese way of tea preparation and the Chinese tea ceremony figured prominently in the course schedule. 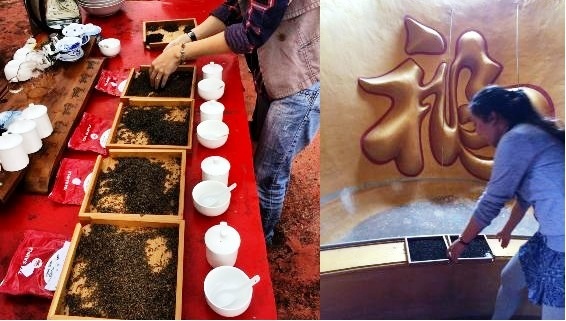 And both Jay and Shana are not only true masters in this, but also great teachers, if it comes to imparting the underlying philosophy, the attitude and the manual dimension of preparing tea the traditional Chinese ritual way. I thought it is a bit like Yoga, or Qi Gong, or Kung Fu… by the way, did you know that “Gong Fu Cha” actually means “Kung Fu Cha”, which translates to something like “The Great Art of Tea”? Thomas: Haha, yes, I knew that. I’ve been reading and writing about Chinese tea preparation and the Gong Fu Cha before at Siam Tea Blog… Ok, so you’ve learnt how to properly prepare tea at the course? Kenneth: I have learnt what really counts in tea preparation. I have learnt that from a holistic perspective, the way you prepare a tea is an essential part of this tea’s way from the tea plant to the cup, the last and final part, if you want so. Imagine, it doesn’t matter how much care and effort have been put into the cultivation and processing of a tea or how expensive it might be as a result, if you are not caring enough in the tea’s final preparation, then everything before was for nothing and you will destroy all the value this tea had, both by nature and by human enhancement, in a matter of minutes. If you are careless enough, then you might even manage to ruin that tea to a degree, where you won’t even be able anymore to enjoy or drink it. And wouldn’t that be an incredible waste? Before you prepare a tea, you need to know as much as possible about it, so you can derive the main factors for its preparation, such as the dosage, water temperature and infusion time, from existing knowledge and experience. Then, you have to focus on what you do, on the tea itself and on each and every activity you perform in its preparation. This takes more than just concentration! It is part of an inner attitude that you need to take on and internalize before you even start preparing tea. If you look at Shana preparing tea, she is as focused as anybody would be, who’d walk across deep water on a high wire with a jar of tiny little diamonds in their hand. You know, though there might be some general rules for tea preparation, each tea is different, and each tea needs to be treated differently. Jay and Shana showed us how to approach a tea step by step in order to finally prepare it. It is more like guiding principles than like an instruction manual that you’d simply have to learn by rote. Often enough, you will even prepare the same tea in different ways, depending on your mood, the time of day, or such miscellaneous factors. This might sound quite complicated, but it is not, and it is one of the many valuable things Jay and Shana have taught us at the course. Thomas: Anything else you want to add regarding your motivations to participate in that course and whether your expectations were met there? What about the ITMA Tea Master Certification you received at the end of the course? Kenneth: The ITMA Teamaster Certification is certainly something of great value in the tea business, especially, if you are kind of new there or have just started to build up your own tea business. For me, it was kind of a “gimmick”… I mean, it’s not that I’d really need such a certificate, but I have to admit that I have been framing it and hanging it up on my wall with a certain sense of pride, and there had been a certain sense of anticipation to do this in the time before and during the course. I am not sure whether I will ever be in a situation again, where possessing this certification and being able to show it will be of any benefit for me, such as applying for a job with a tea-related business, but I am absolutely sure that it is a great tool for people who are on such stage of their tea-related career, and it will definitely add to your credibility and improve the way you are perceived, if you can put this certificate up in your tea shop, post it on your tea website, or simply add the suffix “ITMA certified teamaster” to your name and credentials on professional, business or social platforms. Thomas: Kenneth, this interview is about to become a lot longer than I had planned it, and I have asked less than 10% of my questions, so let me come to another point: how was the actual daily “course life”? What did you do there during those 4 days? Kenneth: Haha, believe it or not, but this is definitely going to blow your interview format! Just that much: life at the course has been all about tea. First of all, we were introduced to a range of wonderful Chinese and northern Thai teas, partially classics, partially specialties, and partially Thai Oolong standards- Shana introduced each tea in a way that even the teas I already knew considerably gained in depth, and I am sure I will always see them in a different light from now on, a light that somehow is much brighter and shows a lot more of the subtle details of a tea than you would usually perceive with a more superficial approach. Let’s take, for example, the Thai Oolongs. I used to know and quite liked them before Shana’s introduction. Also, I have been well aware that some people here really produce Oolong teas of exceptional quality, in terms of picking and processing standards, but their true potential of fascination lies in the details of their cultivation and production. I have already told you that we were introduced to the old Chinese way of preparing tea and the Chinese Gong Fu Cha tea ceremony. So, along with learning how to prepare and trying those teas, we’ve been visiting the tea garden where they came from, and the factory where they were processed, and we’ve been shown and explained these processes on site, where you can actually capture them, much rather than when reading about it in a book. 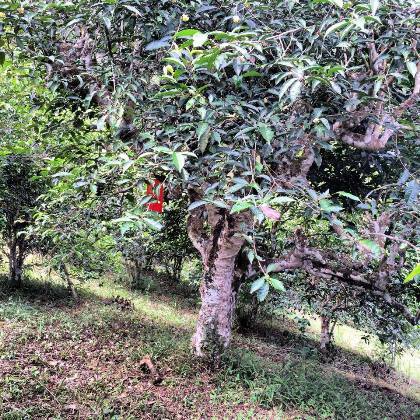 We have even visited a place whith xxxx years old tea trees, which filled me with a deep sense of awe, given how close we were there to the actual cradle of tea, both in geographic terms and in terms of the age of those tea trees. 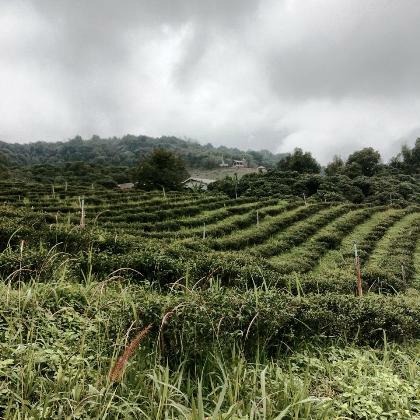 Another activity that really stuck out was our visit to a Pu Erh tea factory. I mean, I have been in Yunnan visiting all the tea region and I might have read hundreds of publications on Pu Erh tea production, but still I need to admit that I was never sure about if I really understood any of it properly or put that knowledge into much of a relation to my actual Pu Erh tea consumption. There, at the Doi Wawee Pu Erh tea factory and with Shana as a teacher with us, theory and practice finally fell into one place. 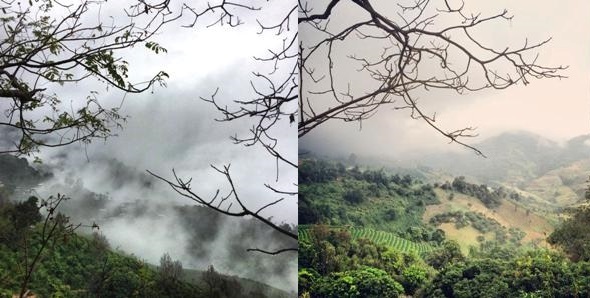 Thomas: Did you take the online course as a follow-up to the on-site course in Doi Mae Salong? Kenneth: Yes, of course, I did! 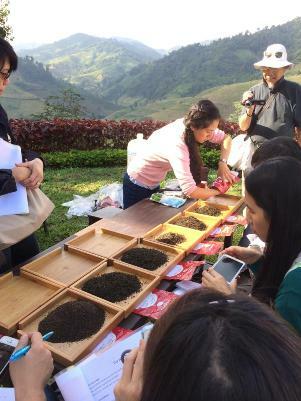 You know, you can’t cover all the theoretical details in just 4 days time, so the on-site course focused on that kind of tea experience that you just can’t gain anywhere else than on the actual venue, where tea is grown and produced. The theory, on the other side, is all packed into that online course. Though knowing a lot of the things being taught there already, I was quite amazed how this online course managed to fill gaps, at times where I had not even known there was a gap! Shana has designed the course, and she has packed it with as much of her knowledge as comprehensibility would still allow. I need to say, though, that I found the actual design of the online representation to be a bit dry. I would have expected more illustrative materials, maybe video footage, and I thought some interactive features would be an overall enhancement of the online course’s grip and entertainment value. Nonetheless, the actual learning contents leave nothing to wish for. Thomas: Ok, Kenneth, we are going to have to come to an end at some point. After all, I will have to transcribe all this and then also translate it into German for my German blog. There is one question left on my list that I want to ask you: what about the fun factor? Altogether, how much did you enjoy the course? Kenneth: Hmmm, I’ve already said that the online course felt a bit like being at school again, but the onsite course really was GREAT fun! I’ve been as lucky as being in a wonderful class of students. I have met amazing people there, I think I‘ve made some friends, and I guess I’ve made some useful connections, too. Again, topping the list is Shana. It’s been such a pleasure to spend 4 days in her company and under her tuition and guidance; I hardly can put in words how much she has impressed me. I really feel like she’s my mentor in tea, and I definitely seek to continue that relationship, and I look forward to doing so. Then… but you know that, Thomas, Doi Mae Salong is such an incredible place, I mean, this town in the middle of these mountains, and that particular type of people, kind of Thai-adjusted Chinese descendants. Then, what adds to the beautiful natural setting and the kind people is that everything here is about tea, and tea gardens are all over and all around town. 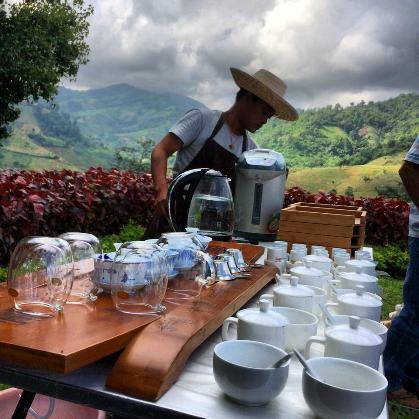 I don’t think there is any better possible setting for a tea course. So, yes, I had a fantastic time at the course. Thomas: Thank you so much again for your time and this interview, Kenneth. I wish you good luck with Monsoon Teas and great success in bringing tea, especially Thai tea, to a broader audience among the Thai people. Kenneth: Good luck to you, too, and my best wishes for Jay and his tea school at Doi Mae Salong. May 08 – May 12, 2015.